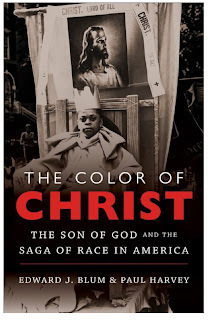 Over at the Historical Society blog, Randall Stephens and Hilde Løvdal conduct an interviewwith Edward J. Blum and myself about The Color of Christ: The Son of God and the Saga of Race in America (UNC Press, 2012). In it, we try to hit some of the main points of the text. A little excerpt below; click here for the rest. Løvdal and Stephens: Could you say something about the malleability of the image of Jesus? How can Jesus appear so different depending on who is using his image? Harvey and Blum: Great question, and that is really the heart of the book. We can best answer that by mentioning the three main myths our book explores about Jesus imagery and shifting appearances. First, there is a myth that humans create God or gods (especially Jesus) in their own image. This myth claimsthat people invariably represent Jesus to look like themselves. So whites make a white Jesus, blacks a black one, Asians an Asian one. But American history shows this is not true, and the myth hides how much racial groups have interacted and affected one another throughout U.S. history. No racial group in the United States has been separate enough to form distinct and impenetrable religious cultures. Moreover, lots of people have worshiped Christ figures that look nothing like them. For centuries, African Americans and Native Americans embraced white images of Jesus, debated them in their midst, and tried to replace them but generally did not. The myth hides the powers of money, of technological access, and of production capabilities. . .
My co-author for the book The Color of Christ, Edward J. Blum, has over the summer had a team of students working on a website to accompany our book, and it’s just about there, so we hope you’ll check it out. The website includes a huge array of supporting and supplementary material to go along with the book — links and images to texts, painting, movies, other books, etc., as well as suggested powerpoint templates, classroom syllabi and assignments, and much other material for teachers and professors. We are also collecting youtube style videos made by a variety of folks both about their own responses to Jesus images in their lives as well as responses to a series of paintings by Janet McKenzie, “Stations of the Cross.” Go here to watch a few of those videos, and more will be posted in the next month or two. I am a Jesus collector. More specifically, I collect Jesus action figures. Don’t worry, my Jesi (I prefer the Latin plural) are not sacrilegious. There is no Jesus with kung-fu punching action (what demon could deny a solid chop from the Living Word) or who changes from lowly carpenter to Transfigured Lord of All (surely a reversible head would suffice). No, these Jesi are advertised as providing children everywhere with the privilege of playing with the Christ rather than some hippie mutant amphibian, militant robot, or creepy baby doll. Most Jesi come with fishes and loaves as accessories, so children can have a tea party (or at least a satisfying lunch) with their savior right out of the box. Expect a review of The Color of Christ at The Way of Improvement Leads Home soon. This is a wonderful post by a young historian at William and Mary, reflecting on my co-authored book The Color of Christ. Enjoy! Each evening for the last couple of weeks, I’ve been slowly making my way through Ed Blum’s and Paul Harvey’s forthcoming The Color of Christ. I’ll have a fuller review in an online journal forthcoming at a future date, but wanted to take a minute to add my voice to the well-deserved chorus of praise sung by Publisher’s Weekly and Matt Sutton. The Color of Christ is a tour de force of the history of both religion and race in U.S. history, brilliantly conceived and beautifully written, at times humorous and at other times moving. More than anything else, though, reading the book has caused me to reflect on the ubiquitous presence of Jesus imagery all around me, from my childhood home and memories to the artistic portrayals of Christ hanging in the hallways of my local chapel to the lyrics of music—both sacred and secular—I listen to day in and day out. It is perhaps not surprising then, that as I read about the expansive “transatlantic exchange of Jesus imagery” in the late 19th and early 20th centuries last night, I was reminded of this gem from Ben Harper’s 2004 collaborative album with The Blind Boys of Alabama. “Picture of Jesus” touches on so many of the themes Blum and Harvey highlight in their book. There is no explicit mention of race in the song’s lyrics, but in it Harper and co. sing about well-worn pictures of Christ’s crucifixion kept in one’s wallet and of Jesus appearing as “a man in our time” whose “words shone like the sun” but who “tried to lift the masses / and was crucified by gun” (Martin Luther King, Jr?). And what of the musicians’ race and religiosity? Harper is the son of an African American father and a Jewish mother, and he often speaks of his rather eclectic spirituality that incorporates not only traditional Christianity but also Rasta and nature religion. Is his “picture of Jesus,” I wonder, the same as that of his collaborators, the (literally) Blind Boys of Alabama, a Christian gospel group whose career has spanned 73 years, survived Jim Crow, and witnessed the Civil Rights Movement and the dramatic shifts in America’s racial and religious composition? A review of my new book (co-authored with Edward J. Blum) in the Publisher’s Weekly, just published (July 9, 2012).